I had initially anticipated that this blog would comment on the solemnity of this occasion, or about the sacrifices made by so many Englishmen (and women) for their country in times of war throughout our long history or even some sad fact about the dead ignored by the living. Not so. Today’s Armistice Day has been fascinating and complex, situated at the end of a week marked by partisan violence and destruction. I struggle to recall one in which so many disparate groups have simultaneously made their voices heard, and can think of no better evidence of the polarised and tumultuous times we both live in and find ourselves on the verge of. In spite of the humble poppy’s central role in remembering the war dead of the 20th century, the symbol’s potency has seemingly never been more heavily scrutinised by the Britain that the dead of the World Wars has become. The predictable, annual reactions to Channel 4 newsreader Jon Snow’s personal opinion on the poppy (Daily Mail vitriol here, Guardian appeasement here) are the tip of the iceberg; here is evidence of a Britain divided racially and culturally in its perception of itself and its history. Predictably, radical Islamists leapt at the chance to get their faces on the news, as well as live up to their ‘counter-counter-culture’ bad-guys-under-the-bed image by burning a poppy in London during the two-minute silence. A stunt directly taken from the Anjem Choudary copybook, and one that evidences the short (or exceptionally long) memory of such protestors: it remains unknown as to whether their main anger was aimed at the poppy as the symbol of active memory for the serving members of HM Armed Forces in Muslim-dominated states now, or a protest against ancient conflicts in Muslim countries. Or both. Or anything tangibly British that they could use to attract more free publicity for a cause that is supported by a pathetically small number of people in Britain. Predictably, and in spite of the fact that it appears to say ‘bloostained’ instead of ‘bloodstained’ (local dialect perhaps allowing), it was not exactly met well. 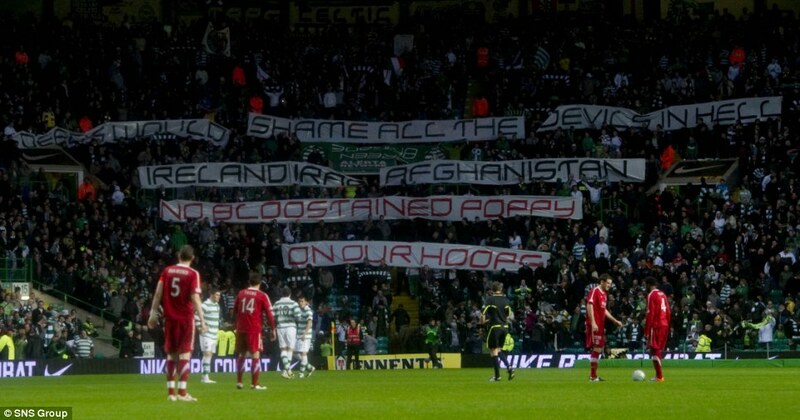 New Labour stooge and Celtic chairman John Reid promised to ban those responsible. What is most interesting about this particular protest is that here the Scottish Catholics are defiantly asserting the fact that the poppy is either Protestant English or Protestant British; an identity that they reject or do not feel affiliated to (respectively). It is perhaps testament to the growing schisms present in the ‘British’ identity, a notion further emphasised by the hugely pro-British Sun newspaper throwing its weight behind the story (significantly enough, in The Scottish Sun alone) in a clear effort to draw ire towards supposed ‘separatists’. The EU, however, cares not for petty tribal squabbles such as this. After all, when one has a historically unprecedented superstate to try to bind together, what trifling matter the course of the history of a continent? “European Heritage Label” to mark sites with “a symbolic European value” that “have played a key role in the history and/or the building of EU“. Has there ever been a more transparent demonstration of the long-term goals of a domineering political entity than an exposition of the ‘building’ of the EU? Even Reuters used the term ‘bind’ to describe the measure. Planned locations are war memorials, the Menin Gate and Ted Heath’s house. I do not plan to award prizes for those among my readers who spot the ‘odd one out’, herein. A shameless attempt to assert European identity as being a homogeneous, bland product of a pointless, damaging political mistake, rather than respecting its true, inherent diversity and its contribution to the world. That aside, would the Germans appreciate the inherent value of the Menin Gate? What is the criteria for this order of merit? Would Trafalgar Square’s historical virtue apply? Would that be considered subversive to the EU? If so (that’s excellent, obviously), would there be aspects of history that are therefore deemed unsavoury, unworthy or politically unacceptable? This is Newspeak, and disrespectful to the living millions of Europeans and the memory of millions more. We would betray the dead by forgetting or being given to ignorance of what they fought for. What is also clear, and what I have attempted to illustrate herein, is that we must never forget that we shall never be immune to future conflict, and to the potential for foreign powers to seek to impose their will upon our island nations. We would do well to keep the memories of battle fresh in our minds, the words of our ancestors close to our hearts and their immeasurable strength close at hand. I shall leave the final words to Sassoon. I am an Englishman. Constantly striving for the truth and to conserve what is good about England. You can find my on flickr at http://www.flickr.com/people/byrnsweord/ my blog over at byrnsweord.wordpress.com/ and my Twitter account at twitter.com/byrnsweord Byrnsweord is min nama. This entry was posted in Uncategorized and tagged 11th november 2010, Anjem Choudary, armistice day, byrnsweord, Celtic poppy banner, england, Englishman, englishness, EU, European Heritage Label, jon snow poppy fascists, Muslims Against Crusades, siegfried sassoon, siegfried sassoon aftermath. Bookmark the permalink. “Gehyrst þu sæliða, hwæt þis folc segeð?